Burger Shack has been making burgers and fries for over 30 years. Located on Eglinton Ave. across from Eglinton Park, this institution offers everything from steak on a kaiser to onion rings. John Batshon doesn’t have to do much to spread the word about his homey Eglinton Avenue hamburger restaurant. John opened The Burger Shack in the mid-80s and likely will still be serving his signature Banquet Burger with a big smile on his face for many years to come. It’s not that he’s reluctant to talk about what makes his burgers so special (some say they’re the best in Toronto). You want to grin just listening to John talk about his ingredients, so enthusiastic yet down-to-earth is his personality. It’s just that it seems unnecessary; the “burgers-like-they-don’t-make-em-anymore” speak for themselves. “I’ll let you in on a simple secret,” he says. 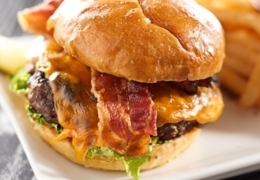 “What makes my Banquet Burger so great is I insist on using fresh beef every day.” Melting cheese and a rasher of bacon add the finishing touches. The eat-in and take-out menu extends to cheeseburgers, veggie burgers, chicken souvlaki plus – and this is important: fresh-cut fries and home-style onion rings. Burger Shack has been around for more than 30 years. And they still put out a great juicy burger every time. They dole out the condiments in a similar fashion to Harvey’s – big stainless steel bowls. Simple and tasty burgers - what else could you ask for?